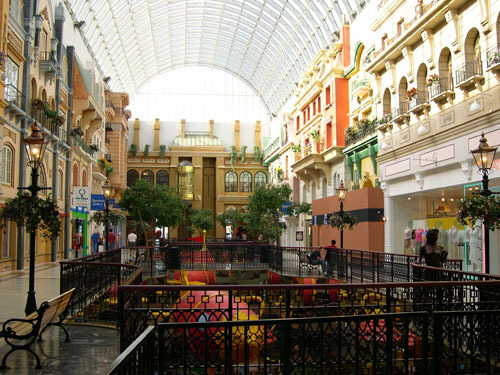 (P1) The West Edmonton Mall is the largest shopping mall in North America and the fifth largest in the world. It is located in Edmonton, Alberta, Canada. It opened in 1981 and has gotten bigger as more shopping areas were constructed. It was completed in 1998. In total, there are now more than 800 stores in the mall. It is so big there are 58 different entrances. Of course, because it is one of the world’s largest malls, it has a very large car park. There are enough parking spaces for more than 20,000 cars. (P2) People sometimes call the West Edmonton Mall the West Ed Mall. There are so many things people can do in the West Ed Mall. It has over 110 different places to eat. There are two Baskin Robbins 31 ice cream stores, two KFCs, and three McDonalds. Surprisingly, there is only one Starbucks coffee shop. If you don’t want to go shopping, you can go for a swim. The mall also has the world’s largest indoor wave pool. The mall also has an indoor amusement park. It is the second-largest indoor amusement park in the world and has 24 rides and attractions. There is always something to do at the West Edmonton Mall! Do you like to go to the mall? Why or why not? Describe a shopping mall in your country. Would you like to go to this mall? Why or why not? In which year did the shopping mall open to the public? How many doors are can people use to enter the mall? What’s another name given to the mall?